Warm yourself with these delicious homemade vegetable soup recipes. The beauty of homemade vegetable soup is that it’s fresh, tasty, nourishing and easy to prepare. You can serve soups as an entree or a hearty main, at any meal of the day. In cold weather, vegetable soups are a warming and comforting meal. They can also provide a satisfying light meal in hotter weather, just vary the thickness and the serving size. Vegetable soups are a great way to use up slightly past vegetables in the fridge or deal with a huge seasonal supply of tomatoes, potatoes or zucchinis from your vegetable garden. Left-overs can then be preserved in your freezer and defrosted for convenience later. Freezing vegetable soups is a healthy alternative and is no problem as they’ll keep for up to 3 months. 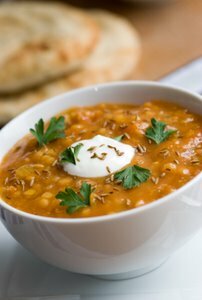 Recipes usually tell you soups can be refrigerated for up to 3 days, but let’s face it, most us will happily eat week old soup and still enjoy it! Vegetable soups are so simple to make that they are a great addition to the menu for budding chefs. You can’t really go wrong with chopped vegetables boiled up in stock. Yet there are so many different vegetable, herb and stock combinations to try that you will never get bored. If you learn how to make your own stock you can ensure that it’s preservative free and not salt-laden. Stock can be frozen in icecubes in the freezer until you need it, too. If you buy stock, look for brands that have no salt added. Vegetable soups are a great way to help you get the recommended 5 serves of vegetables a day. A bowlful of healthy homemade vegetable soup generally contains 2-3 servings of vegetables. Soups can be served blended or unblended, depending on your mood and preferences. Blend with a hand held blender, food processor or upright blender, but cool the soup a little first so that it doesn’t explode all over your kitchen.